A china cabinet is a unit of furniture used to store and display crockery, traditionally china hence the name, but nowadays it is for whatever sort of ware that you have. Usually there are cupboards for storage on the bottom and glass display units on top. 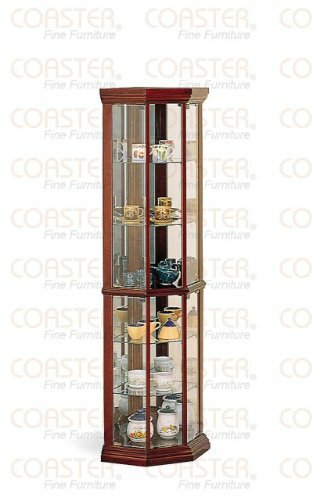 China cabinets can vary in size, but generally they are about six feet tall and can have single, double, triple or quadruple panels. You can decorate a china cabinet in many ways, but essentially in order to look its best the items on display should be clean and dust free. Likewise the shelves and the glass panels should always be kept sparkling and free from hand marks. The display of your ornaments should be in an ordered, balanced fashion that is aesthetically pleasing to the eye. For example if you have a tall vase on the left you should have tall item on the right, not necessarily exactly the same height but so that there is equilibrium in the overall presentation. If the china cabinet is in a prominent position in your house, it can be a good idea to change the decoration depending on the time of year. At Christmas add holly and tinsel, for Halloween, put some pumpkins. If it is a birthday or an anniversary celebration, you can add photographs. In the summertime place a bowl of seasonal fruits in front, that way you simply but effectively change the decoration. This is an inexpensive means to redecorate. It is also possible to add lights to the cabinet and this can be a nice decorating effect. It can highlight items and ornaments that you wish to enhance. Another interesting idea is to put mirrors at the back of the display cabinet and this can reflect out the shapes and colors of the ware. Also decorating your china cabinet with differing crystals is becoming increasingly popular. As you can see with this particular mode from Coaster Home furnishings -- mirrors have been implemented on the backing. cabinet. You can do this by painting. However ensure that you have the correct type of paint for the wood of your cabinet. On a smaller level you can add stencil motifs or change the drawer and door handles. These little touches often revitalize a piece of furniture. If you are updating your room, by painting the cabinet in a neutral muted colour, you will modernize and transform the entire decoration. 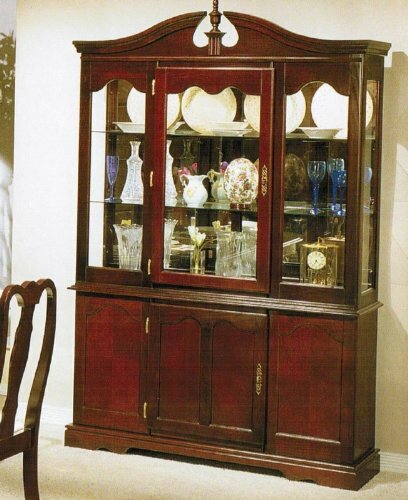 Before embarking on project to redecorate your china cabinet, it is a good idea to do some research and get ideas. The internet is an excellent resource with lots of images and also you will find how-to demonstrations that you can follow step by step. There are also lots of magazines and DIY books where you can get help. You can also call upon professional decorators and cabinet makers and ask their advice. For instance, you can Inspect cabinets that are on sale that have been designed with 'visual appeal' and 'originality' at the forefront & you can take particular aspects and ideas from these and involve them in your own cabinet. How Will You Personalize Your Cabinet? There are plenty of different colour paints. You can re-organise the order of your ornaments. At the end of the day how you decorate your china cabinet depends on your taste and what items you wish to put on display (there are literally thousands upon thousands of designs). What matters most is that you like the decoration and style and that it fits in with the rest of your decor. If at some stage you go to a lot of trouble and have it repainted, it is possible that the end result might not be what you imagined or the color might be not quite right. Quite simply you do not like the finished result, don’t worry it can always be redone, that is the beauty of wood.